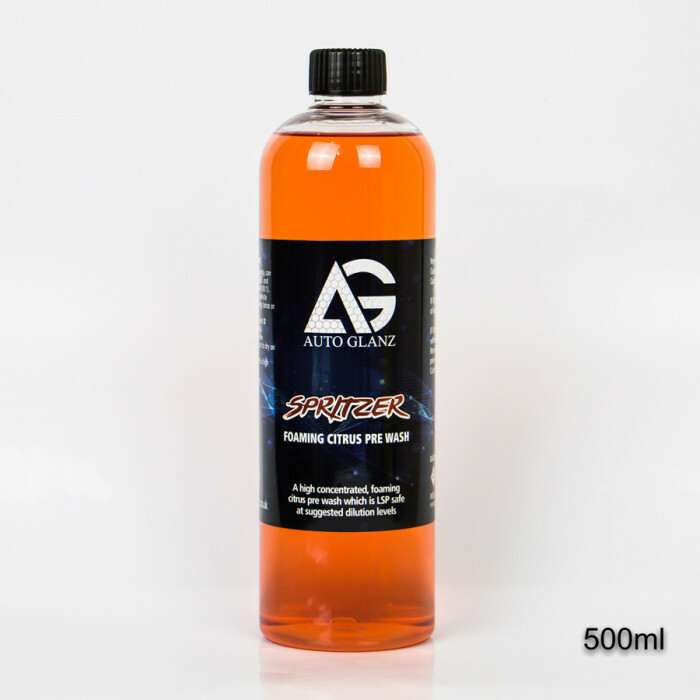 The mildly alkaline formulation of Spritzer Citrus Pre Cleaner does not degrade wax or protective layers and can be used on all vehicle surfaces without having to worry about sensitive finishes or trims. The added foaming properties ensure that all contaminants on the vehicle are lifted and safely removed from the surface before you make direct contact during your wash routine and therefore reduce the risk of causing any damage to the vehicle. Spritzer can be diluted up to 250:1 with water and has the ability to be used through either a dedicated foam lance or a kwazar foam sprayer for those who do not have access to a foaming lance. One benefit of a foaming citrus pre wash is that they have higher cleaning capabilities than a regular neutral Snowfoam, however it has a much shorter dwell/work time, leaving you more time to concentrate on other parts of your routine. Conventional pre cleaning – Between 25:1 to 250:1. As a Snowfoam replacement – Between 25ml and 200ml mixed in a 1L foam bottle with warm water. As a standalone cleaner – as desired, higher dilutions may degrade sensitive show waxes. Apply directly to the vehicle's surface using a foaming lance or trigger sprayer. Allow to dwell for a few moments, do not allow to dry on the surface. Rinse thoroughly with high pressure wash.